This part of the transcript commences as Apollo 11 passes behind the Moon on its last orbit before undocking. It re-emerges as two separate spacecraft with their own call signs, Columbia and Eagle. They make one further lunar orbit, then the Eagle enters its descent orbit by firing its main engine behind the Moon. This section of the transcript ends with the spacecraft re-appearing from behind the Moon, prior to the Eagle making its final descent and the first lunar landing in the Sea of Tranquillity, an account of which is continued in the Apollo Lunar Surface Journal. Though the two spacecraft are still joined at their docking ports, the docking equipment has been installed in the tunnel and the hatches on either side are in place. Neil and Buzz in the LM are separated from Mike in the CM and can only communicate by radio. 099:32:31 Aldrin (onboard): Okay, I'm ready to go to B-Data now. The Abort Guidance System (AGS) is less sophisticated than the primary system. It's only intention is to get the LM to a safe orbit should the primary system fail. It has no inertially stabilised platform for accurate attitude determination and its computer is much simpler than the LGC machine that will control the landing. It gets its sense of orientation from a set of strapped-down gyroscopes, units that are affixed to the spacecraft body and which derive rate of rotation rather than absolute rotation by measuring the forces that any rotation will place on their mountings. They are inherently more prone to drift and an attempt is made during their calibration to compensate for this drift. The idea is that the spacecraft holds a steady attitude using the primary system and the amount of drift in the AGS gyros is measured over a 302-second time frame. This should yield a measure of their drift which is stored and used in subsequent computations. At the same time, the accelerometers in the AGS are also calibrated. Since the craft is in freefall, they should indicate zero acceleration and any reading from them would indicate their inherent bias. This can also be compensated for. Neil is the Czar of the ship - or has been since yesterday at 072:29:46 when Fred Haise read up a news item to the crew from Pravda, the newspaper of the Soviet Union that described Neil in those terms. The tanks of the Descent Propulsion System (DPS, pronounced 'dips') are pressurised by helium that is stored in two tanks; one at an ambient temperature, the other storing the gas in an extremely cold, high pressure state called supercritical. This condition allows the density of helium in the supercritical tank to be eight times that in the ambient tank. Because the supercritical helium is so cold, it will not be permitted to flow to the propellant tanks until after the engine has started. This is because the fuel itself is used to warm and expand the supercritical helium in a heat exchanger. Opening the supercritical helium valves too early can cause the fuel to freeze. Instead, this initial pressurisation is achieved with helium from the ambient tank. When Eagle leaves the Moon's surface, it must return to Columbia as the CSM is the crew's only means to return to Earth. A primary means of locating the CSM is the Rendezvous Radar. A crop of image AS11-44-6642 taken by Mike Collins as Eagle approaches Columbia. 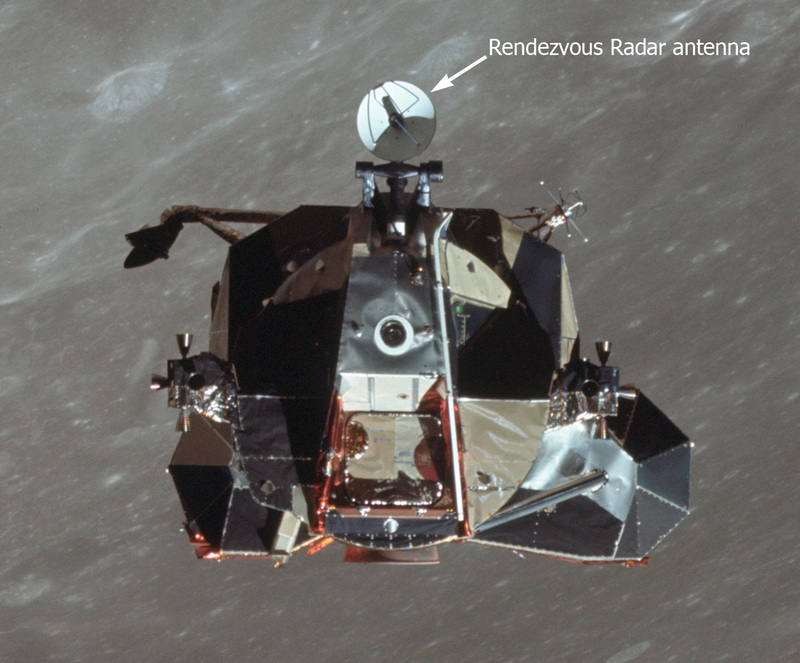 This is Eagle's ascent stage and shows the location of the Rendezvous Radar antenna. 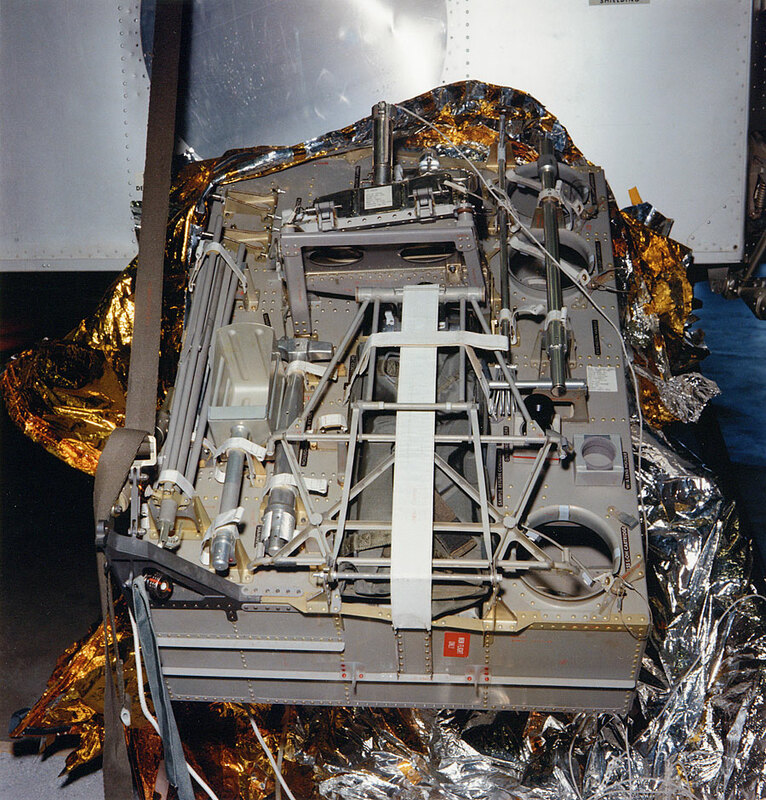 The Rendezvous Radar works with a transponder on board Columbia to determine the range between the two spacecraft, the rate at which the range is changing and the direction or angle to Columbia. This data can then be used to compute the burns required to bring the two craft together. Buzz has a 16-mm Maurer movie camera mounted in his window. As well as filming the landing, he will use it to film the CSM soon after undocking. What Mike is talking about is depth of field. His experience and training has told him that there are a range of distances in front of a camera that, to all intents and purposes, are in focus. This is known as depth of field and it varies with the aperture of the lens. Use a large aperture (for example f:2.8) and the depth of field will be very narrow. Out-of-focus objects beyond and nearer than the focus distance are more blurry. Make the aperture smaller (f:8) and the depth of field increases. For the setup they have, Mike reckons that if they set the focus to only 7 feet, then everything will be in focus whether it is infinitely far away right down to being only a few feet away. Mike films the undocking using a 16-mm Maurer movie camera. Known by NASA as a Data Acquisition Camera (DAC), its removable magazine, serial 'C', is loaded with Ektachrome-type reversal film. As the LM moves away, Neil rotates the lander to allow Mike to inspect its exterior and in particular, to ensure that the four landing gear are properly deployed. This is Apollo Control at 100 hours, 14 minutes. We're now less than 2 minutes from reacquiring the spacecraft on the thirteenth revolution. When next we hear from them, the Lunar Module should be undocked from the Command and Service Module. We're presently about 25 minutes away from the separation burn which will be performed by Mike Collins in the Command Module to give the LM and the CSM a separation distance at the Descent Orbit Insertion maneuver of about 2 miles. We have some times on the upcoming events. The separation maneuver is scheduled to occur at a Ground Elapsed Time of 100 hours, 39 minutes, 50 seconds; the Descent Orbit Insertion maneuver, which will be performed on the backside of the Moon, set for 101 hours, 36 minutes, 14 seconds; and the beginning of the powered descent at 102 hours, 33 minutes, 4 seconds. We're now 55 seconds from reacquiring Apollo 11 on the thirteenth revolution. During this revolution we will be doing the separation maneuver. We'll also be giving the crew on the Lunar - on the Lunar Module a Go/No-Go for the Descent Orbit Insertion maneuver. We'll stand by now to reacquire the spacecraft. We have confirmation of Acquisition Of Signal. We'll stand by for a call to the crew. Around now, while both spacecraft are over the crater Saenger, Buzz begins to film Columbia on 16-mm magazine G as it orbits alongside the LM. At this point, it is trailing the LM but as their separate orbits continue, Columbia will increasingly go below Eagle. Buzz will film the CSM on 6 separate occasions including its pass over the landing site. The MESA is the Modularized Equipment Stowage Assembly, a panel on the side of the LM's descent stage between two of the landing gear. The MESA is hinged so that on the surface, the crew can access the items that are mounted within. Full view of the training MESA. Scan by Kipp Teague. The computer's major mode is set to program 00 (pronounced 'pooh') and Mission Control given permission to access the computer's erasable memory by the Updata Link switch on panel 12 being placed in Data. Fans of the NASA film, Moonwalk One, directed by Theo Kamecki, may be familiar with this PAD as Duke's reading of it was used in the film's soundtrack. 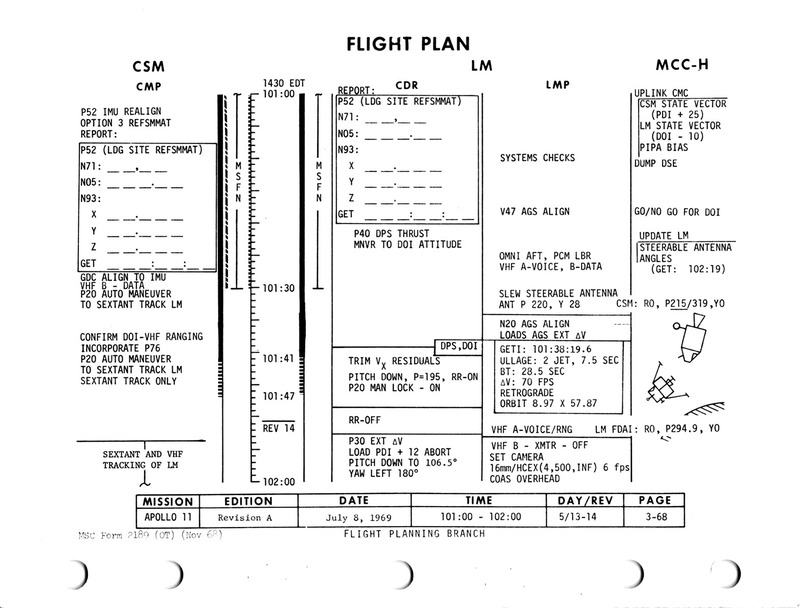 The data is entered into a P30 PAD, an example of which is on page 2-35 of the Flight Plan. Purpose: Descent Orbit Insertion. A short burn that changes their trajectory from a roughly circular orbit at an altitude about 60 nautical miles (110 km) to an elliptical orbit that has a low point or perilune of about 50,000 feet (15,000 metres). The shape of that orbit will place the perilune about 500 km east of the landing site, about over Mount Marilyn. Time of ignition (TIG, Noun 33): 101 hours, 36 minutes, 14.07 seconds GET. Change in velocity (Noun 81), fps (m/s): x, -75.8 (-23.1); y, 0; z, +9.8 (+3.0). The change in velocity is resolved into three components which are quoted relative to the LVLH (Local Vertical/Local Horizontal). In this case, the major change is retrograde, slowing the LM down slightly and therefore lowering its perilune. HA, expected apolune of resulting orbit (Noun 42): 57.2 nautical miles (105.9 km). HP, expected perilune of resulting orbit (Noun 42): 8.5 nautical miles (15.7 km). Delta-VR: 76.4 fps (23.3 m/s). This is the total change in velocity the spacecraft would experience and is a vector sum of the three components given above. Burn duration or burn time: 30 seconds. Velocity to be gained (Noun 86), fps (m/s): VGX, -75.9 (-23.1); VGY, 0 (0); VGZ, +9.0 (+2.7). We believe Noun 86 is being used as a holding register for velocity data to be entered into the AGS. Like the way that the EMS is used in the Command Module as a backup measurement of Delta-V, we think the AGS is fulfilling the same role in the LM. 100:21:55 Duke: Understand you are ready to copy the PDI data, Eagle. Over. Two cameraman are in the Mission Operations Control Room (MOCR) to film the events. Courtesy of journal contributor Stephen Slater, these clips, which were filmed mute, have been synchronised with the air/ground audio and, where appropriate, the Flight Director's loop. This clip shows Charlie Duke at the CapCom console reading out the PDI abort PADs. Deke Slayton (foreground) and Jim Lovell look on. 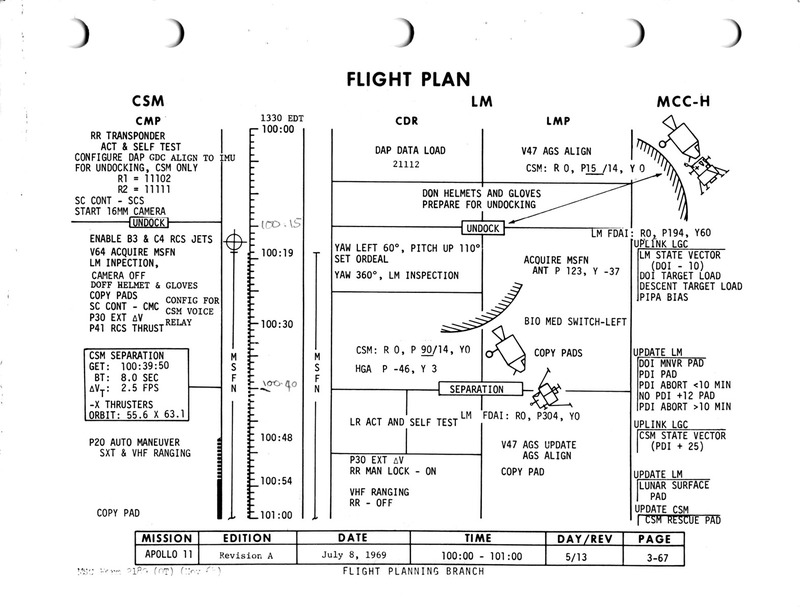 The forms for filling in the PDI PAD are on page 2-37 of the Flight Plan. Here is how the PAD is interpreted. Purpose: The first part of the PAD gives details of the burn that will take the crew to the lunar surface. The manoeuvre is known as powered descent and so the start of the burn is called Powered Descent Initiation or PDI. Next come a series of PADs for burns that would be used to return to the Command Module in the event of an abort. We think it assumes that the AGS has carried out an automatic return to orbit. First is a PDI abort less than 10 minutes. Currently we believe that this means in the first 10 minutes after PDI. Time of ignition, TIG for TPI burn (Noun 37): 105 hours, 12 minutes, 30.00 seconds. 100:25:39 Aldrin: Okay, PDI PAD: 102:33:04.36; 09:50; minus 0002.1; 182, 287, 000; plus 56919. PDI less than 10: 105:12:30.00. PDI abort greater than 10: 103:40:00.00, 107:11:30.00. No PDI plus 12 abort: 102:44:27.00; plus 0122.3, minus all zeros, plus 0188.9; 0152.0, plus 0011.0, 0225.0, 0:46; 000, 190; plus 0118.7, plus 0000.0, plus 0191.1; 103:31:07.00; 105:12:30.00. Over. Duke means 9 minutes, 30 seconds until his engine firing which will separate the CSM from the LM. 100:30:53 Duke: Eagle, Houston. Would you have Columbia go to the High Gain, yaw 0, pitch minus 20. Over. [Pause. 100:31:03 Armstrong: You want him to go to High Gain, yaw, zero, ah - say again the numbers. As they continue to coast across the Moon's near side, Buzz starts another shot on the 16-mm camera of Columbia passing above Mare Fecunditatis and the crater Anville. As is normal for CSM burns, not only is the Delta-V monitored using the primary guidance system, Mike also has the Entry Monitor System (EMS) and its own accelerometer measure the effect of the burn. It is convention to offset the EMS's Delta-V display by 100 and measure the burn relative to that, hence 105.4, meaning 5.4 fps. Essentially, Mike hadn't yet stopped P41, the program that controls the RCS for burns like this. This is Apollo Control. That separation maneuver was performed as scheduled, giving the Command Module a Delta-V of about 2.5 feet per second, which should give a separation to the two vehicles of about 1,100 feet at the beginning of the Descent Orbit Insertion maneuver. Buzz takes more footage of the CSM orbiting below. He starts the camera as they approach the crater Maskelyne and the feature known as Boot Hill. The last of the six shots that Buzz takes of Columbia on this pass begins as Mike appears to cross Sidewinder Rille. The shot continues as he passes abeam of the crater that will later be named Armstrong. The shot ends just after he passes what will become Tranquillity Base, the Apollo 11 landing site. The primary purpose of the VHF radio system is to provide alternative short range voice communications between the two spacecraft. However, it also has the ability to be used in a ranging mode whereby it will use the delay in the return time of transmitted tones to calculate range. It must be switched to this mode and cannot then be used for voice. It is intended as a backup in case the LM's Rendezvous Radar fails. These are the same ignition times for rendezvous that have just been read up to the LM crew. Once Eagle lands on the Moon, Neil and Buzz must be prepared to launch in case a problem arises. Studies of the situation have defined a number of points in time when a launch would be desirable depending on the position of Columbia in its 2-hour orbit and their ability to catch up with it within the capability of the LM's ascent propulsion. The first opportunity is T-1 which is based on an immediate decision on whether to stay on the Moon as soon as they land. A few minutes later, Mission Control would again decide whether Neil and Buzz should stay. If not, they would launch at T-2, about 8 minutes, 50 seconds after landing, still within their capability to catch up with Columbia. If they do stay at T-2, their next opportunity to launch would be T-3 which waits about 2 hours for Columbia to orbit once around the Moon and return to a favourable position. The subsequent times given with T-2 and T-3 refer to the burns that would be made to rendezvous with the CSM. Buzz and Mike are comparing their ranging systems, Buzz using the Rendezvous Radar and Mike using the VHF ranging system. 4,200 feet is 0.69 nautical miles. P76 in the CM computer is called Target Delta-V. The data is essentially the LM's DOI PAD. It is interpreted as follows. Delta-V (Noun 84), fps (m/s): x, -75.8 (-23.1); y, 0; z, +9.8 (+3.0). The change in velocity is resolved into three components which are quoted relative to the LVLH (Local Vertical/Local Horizontal). Time of ignition (TIG, Noun 33): 101 hours, 36 minutes, 14.0 seconds GET. The error is Mission Control's, not that of Collins. This is Apollo Control. We're coming up on 15 minutes now until Loss Of Signal with the Lunar Module. Flight Director Gene Kranz has just advised his flight controllers to review all of their data, take a good close look at the spacecraft, in preparation for a Go/No-Go decision on the Descent Orbit Insertion. This clip is focussed on Jim Lovell as Charlie Duke reads out the LOS and AOS times. This video clip shows Charlie Duke as he speaks to Buzz. Jim Lovell is seated next to him with Fred Haise beyond. 101:17:07 Duke: Eagle, Houston. It appeared to us when you're doing the P52, maneuvering, the S-band - the High Gain went into the stop. Verify that both S-band breakers are in. Over. 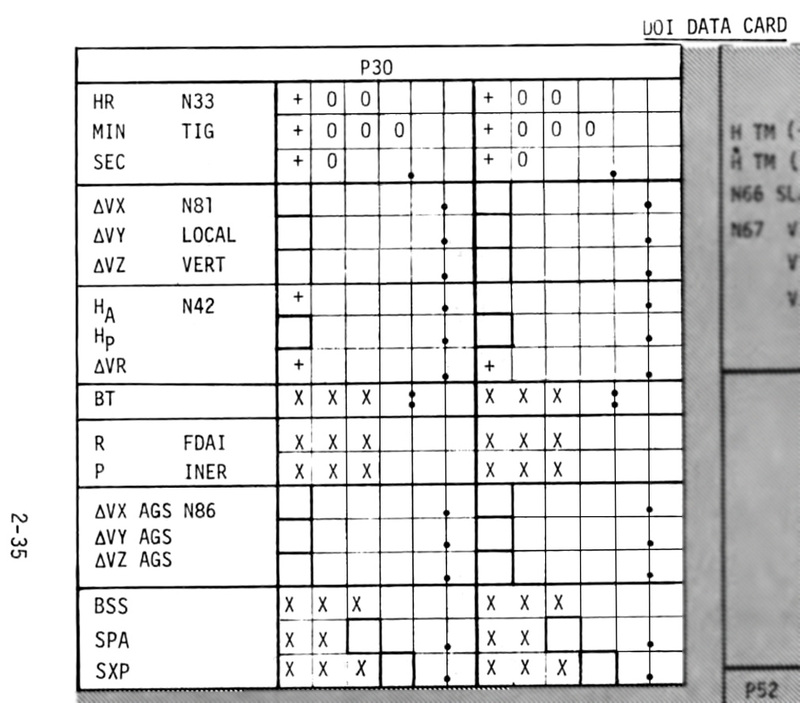 The Mission Report lists the platform realignments made by Eagle in a table. The first realignment in its list is marked as occurring at 100:15. This time is incorrect as Eagle had just undocked and was manoeuvring to allow Mike to inspect the spacecraft. Neil will read out the gyro torquing angles in a few minutes which indicate that the time ought to have been listed as 101:15, which is around now. The star angle difference, Noun 93, is 0.03°, this being a comparison of the measured angle between the two stars and the actual angle based on its internal data. The gyro torquing angles were -0.292° in X, +0.289° in Y and -0.094° in Z. The stars used were 25 (Acrux, Alpha Crucis) and 33 (Antares, Alpha Scorpii). When Neil first aligned the platform, he used the spiral and cursor technique through the AOT. Now that the LM is flying as a free spacecraft (not docked to the CSM or sat on the Moon), he used the second technique where he manoeuvred the LM to cause his selected stars to cross the X and Y lines as seen through the AOT eyepiece. According to the Mission Report, Mike is also carrying out a realignment of the CSM's guidance platform around this time. Mike sighted on stars 01 (Alpheratz, Alpha Andromedae) and 06 (Acamar. Theta Eridani). The angles through which the platform had to be rotated to restore its ideal orientation were +0.084° in X, +0.124° in Y and -0.010° in Z. The difference in the actual angle between these two stars and Mike's measured angle is 0.01°, a good result. Charlie Duke is shown in this clip as he speaks to the crew prior to LOS. This is Apollo Control. We've had Loss Of Signal now, and the spacecraft Eagle has been given a Go for Descent Orbit Insertion. That maneuver to occur in 7 minutes, 40 seconds; out of contact - out of radio contact, the DOI maneuver scheduled to come at 101 hours, 36 minutes, 14 seconds; and it will be a 76.4-foot-per-second [23.3-metres/second] burn. The burn duration, 29.8 seconds. And the resulting orbit for the LM will be 57.2 by 8.5 nautical miles [105.9 by 15.7 km]. When next we acquire the Lunar Module, it should be at an altitude of about 18 nautical miles [33 km] on its way down to the low point of about 50,000 feet [15,000 metres] from where the powered descent to the lunar surface will begin. As the spacecraft went around the corner, all systems on both vehicles looked very good. Everything is Go here in Mission Control, and aboard the spacecraft for the Descent Orbit Insertion to occur in 6 minutes, 38 seconds. This is Apollo Control, Houston, at 101 hours, 29 minutes. 101:29:13 Aldrin (onboard): Very good. If you are ready, give the mark and we'll go to B-Data. Over. Channel B of the VHF communications system allows engineering data from the LM to be sent to the CSM for recording and subsequent transmission to Earth. 101:29:59 Aldrin (onboard): Okay, let's switch to B-Data now. This is Apollo Control at 101 hours, 35 minutes. We're now less than one minute from the scheduled time for the Descent Orbit Insertion maneuver, to be performed by the Lunar Module on the back side of the Moon, where of course, we don't have radio contact with the spacecraft. In Mission Control here, where normally maneuvers of that sort would be monitored on plot boards in front; we have the boards set up, but they're for the powered descent to occur about one half rev from now over Landing Site 1. Flight controllers standing around in little groups. Not much that we can do at this point until reacquiring the spacecraft. We're now 20 minutes - or 20 seconds rather - from ignition on the Descent Orbit Insertion. It will be a 29.8-second burn of the 9,800-pound thrust [43.6 kN] Descent Propulsion System. While the PAO announcer has his microphone keyed, a voice in the background can be heard counting down, '3, 2, 1...'. >We should be burning at this time. The result of this maneuver will be to put the spacecraft into an orbit 57.2 by 8.5 nautical miles [105.9 by 15.7 km]. It would remain in that orbit until powered descent. We should have cut-off by this time. That should have completed Descent Orbit Insertion maneuver. We would expect to reacquire the Command Module first. Command Module acquisition time is 102 hours, 14 minutes, 38 seconds. That will be just about 2 minutes prior to the time that we will have reacquired the Lunar Module. LM acquisition time is 102 hours, 16 minutes, 25 secomds. That is about 37 minutes, 20 seconds from now on the CSM, and about a little less than 2 minutes longer than that for the LM. At 101 hours, 37 minutes; this is Apollo Control, Houston. The accuracy of this burn is important. Thirty seconds of burn has brought the altitude of the LM's orbit on the opposite side down from about 60 nautical miles to only 8.5 nautical miles. Each second of the burn took 1.7 nautical miles off this altitude and at a coarse level, it is easy to see that it wouldn't take much of an overburn to risk impact with the lunar surface. But more importantly, they want to reach a perilune as near to 50,000 feet (15,000 metres) as possible because this is the altitude from which the descent to the surface has been planned. For this reason, when the main burn was complete, they consulted the DSKY's Delta-V display, saw what velocity still had to be gained or lost and fired their RCS thrusters to achieve as near to zero on all three displays as possible. This is known as nulling the residuals. We believe Buzz misspoke and meant Program 76 for which Duke read up a PAD at 101:01:05. The program is called Target Delta-V and it would allow Mike to reproduce the LM's DOI burn. We assume this is their range from the CSM in nautical miles. This is the PDI plus 12-minute abort PAD. If PDI doesn't occur, they will make a burn 12 minutes later to begin a rendezvous with the CSM. He is pitching the Lunar Module forward so that the engine thrust axis is correctly aimed for PDI when they arrive at their perilune. This will be about 500 km east of the landing site. Eagle is flying in an inertial attitude, one which stays fixed with respect to the stars rather than rotating to maintain one side facing the Moon as it goes around. When it reaches its perilune, they want it to be flying engine first but because they are on the opposite side of the Moon, it is flying engine trailing. This is Apollo Control at 101 hours, 54 minutes. We're now about 20 minutes, 45 seconds from reacquiring the Command Module on the 14th revolution. The time until the ignition for the powered descent is 38 minutes, 55 seconds. Here in Mission Control, people still standing and waiting. I believe back in the viewing room, we probably have one of the largest assemblages of space officials that we've ever seen in one place. Included among the viewers are Dr. Thomas Paine, NASA Administrator; Jim Elms, Director of the Electronic Research Center at Cambridge; Dr. Abe Silverstein, Director of NASA's Lewis Research Center; Rocco Petrone, Director of Launch Operations at Kennedy Space Center is there. From Marshall Space Flight Center, we have Dr. Wernher von Braun, the Director, and his Deputy, Dr. Eberhard Rees. Also a large number of astronauts including Tom Stafford, Gene Cernan, Jim McDivitt and John Glenn. We also see Dr. Kurt Debus, Director of the Kennedy Space Center; and Dr. Edgar Cortright, Director of the Langley Research Center. Dr. Stark Draper, Director of the Massachusetts Institute of Technology Instrumentation Laboratory, is also in the viewing room. Here in the control room proper, down on the floor, a number of astronauts including Pete Conrad, Fred Haise, Jim Lovell, and Bill Anders; and Donald K. Slayton, Director of Flight Crew Operations at the Manned Spacecraft Center. Sitting beside us in the back row of consoles here is Dr. Robert Gilruth, Director of the Manned Spacecraft Center. Further down along the line is General Sam Phillips, Director of the Apollo Program. Also Chris Kraft is here, Director of Flight Operations at the Manned Spacecraft Center; and George Low of the Apollo Spacecraft Program Manager. We also see in the back viewing room, Secretary of the Air Force Seamans, and many others who I'm sure we can't see through the glass. We're now 18 minutes, 10 seconds until reacquisition of the spacecraft. Ignition for the powered descent to the lunar surface is 36 minutes, 30 seconds away. At 101 hours, 57 minutes; this is Apollo Control, Houston. Verb 76 is Minimum impulse command mode. AELD is the Ascent Engine Latching Device. CWEA is the Caution and Warning Electronics Assembly. It is actually 27:20 to the PDI burn. This may be a mistranscription. The Rendezvous Radar is powered up so that by the time of the descent, it is warmed up and operational in case it is called upon to help with rendezvous after an abort. Over the decades, a myth has built up that Buzz had powered up the Rendezvous Radar when he wasn't supposed to and that this was the cause of the computer alarms that would dog the descent to the surface by virtue of the computer being overloaded. 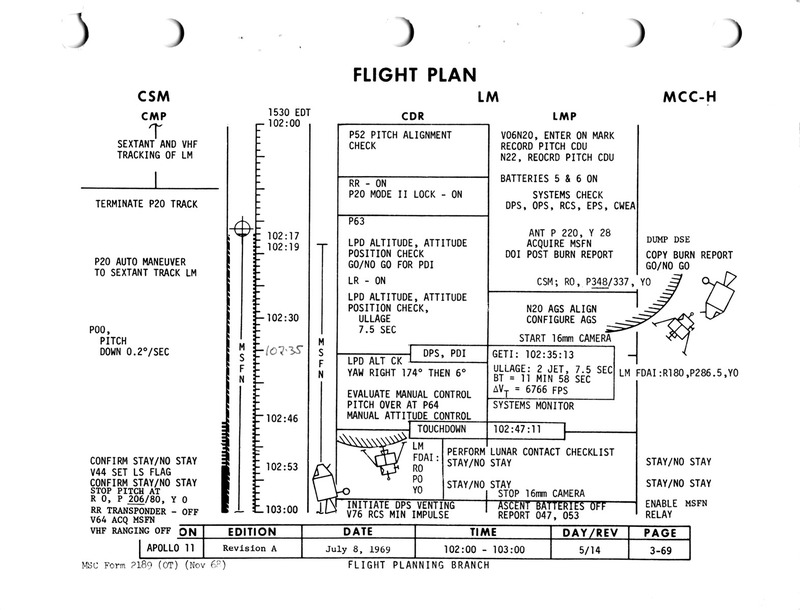 However, as shown by the fact that the Flight Plan indicates that the radar should be on, this notion is incorrect. Further, the computer overload was caused by an unfortunate electronic 'funny' that came about when the system was switched on. Had they switched it off and on again, the funny would likely have cleared. Mode 2 seems to be referring to P20, the rendezvous navigation program. Since the Rendezvous Radar works with a transponder in the CSM, Buzz may be referring to Mike. P63 is the first of three programs (63, 64 and 66) which will control the descent to the lunar surface. P63 is started long before PDI and it initiates the burn, the moment of PDI itself. It then controls the braking phase of the descent for about 9 minutes, taking care of the LM's attitude and the throttle setting of the descent engine. This is Apollo Control at 102 hours, 12 minutes into the flight of Apollo 11. We're now 2 minutes, 53 seconds from reacquiring the spacecraft; 21 minutes, 23 seconds from the beginning of the powered descent to the lunar surface. It's grown quite quiet here in Mission Control. A few moments ago, Flight Director Gene Kranz requested that everyone sit down, get prepared for events that are coming, and he closed with a remark 'Good luck to all of you'. Here in the - on the front of our display boards we have a number of big plot boards which will be used to keep track of the burn progress. Among the more important of those is one which will show the performance of the onboard guidance systems, both the primary and the back-up guidance system, and compare the guidance systems with the Manned Space Flight Network tracking. These displays, by the time this is all over, will look a good deal like a combination of Christmas tree and Fourth of July. We're now 1 minute, 39 seconds from reacquiring the Command Module Columbia. Acquisition of the Lunar Module will come a little less than 2 minutes after that. At the time we acquire the LM it should be at an altitude of about 18 nautical miles, descending toward the 50,000-foot [15,000-metre] pericynthion from which point the powered descent to the lunar surface will be initiated. If for any reason the crew does not like the way things look as they are coming across the pericynthion, simply by not initiating the maneuver they will remain in a safe orbit of 60 miles by 50,000 feet [111 by 15 km], and if they desired they would be able to attempt the powered descent on a following revolution at a Ground Elapsed Time of about 104 hours, 26 minutes. We are now coming up on 30 seconds to acquisition of the Command Module. We'll stand by for that event. Network controller says we have Acquisition Of Signal from the Command Module. At this point, this edition of the Apollo 11 Flight Journal hands over to the first chapter of the Apollo Lunar Surface Journal, The First Lunar Landing. The following 2 minutes or so of dialogue are provided as overlap with the ALSJ to facilitate read-across, and to bring the Flight Journal up to the point of Acquisition Of Signal on the last occasion before landing. Being in a higher orbit, Columbia regains contact with Mission Control first. Eagle is now flying faster in its lower descent orbit, dropping towards the surface. Although somewhat closer to Earth than Columbia, Eagle is more closely hugging the surface and remains hidden behind the Moon for almost two minutes longer. We have Acquisition Of Signal from the LM. Having now re-acquired signal, first from Columbia then from Eagle, Mission Control starts to monitor closely the Eagle's continuing descent, leading up to engine re-ignition as it approaches the landing site. 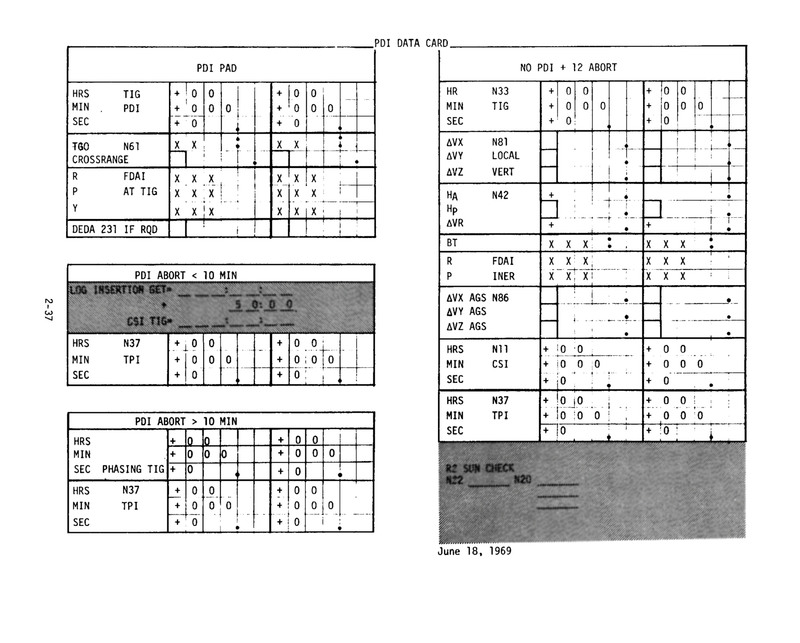 The flight transcript continues in the Apollo Lunar Surface Journal, first chapter.